And… it looks pretty good! 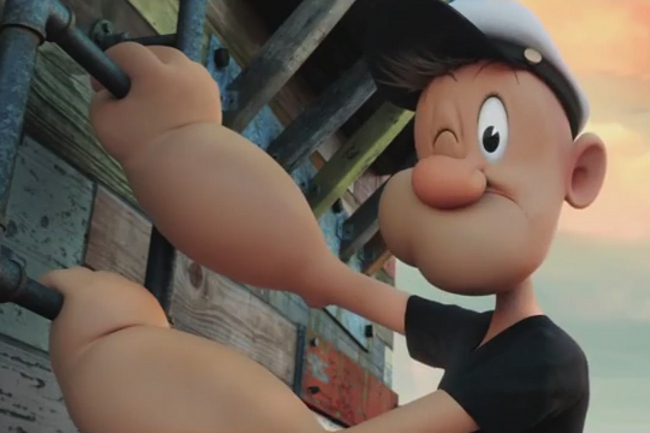 I mean, a CGI Popeye is perhaps not the most ideal situation in the first place — but if that’s your only option, doing it with Genndy Tartakovsky is a great way to tackle it. After wrapping up Hotel Transylvania (which was a bit of a rescue project for Tartakovsky), he had a chance to point Sony Pictures Animation in a different direction: Popeye! They’re definitely applying a lot of traditional animation techniques to the CGI, giving it a flexible, unique look. I think it’s safe to say the visual style of the film will be in good hands — I hope Tartakovsky and the script-writing crew can make the story worthwhile, too! The test footage is below.